. . . it was just the start. Shoes representing my twin brother & Dad holding me. I found out I was affected by abortion about 3 years ago. This changed my life. I had walked into the Coalition For Life wondering what their organization provided and 5 months later I met my birth mother who told me my life is a miracle. My birth mother was 13 years old at the time she became pregnant with me. Her mother took her straight to an abortion clinic where she had a surgical abortion. After thinking she had “fixed the problem,” a few weeks later she realized her belly was still growing. 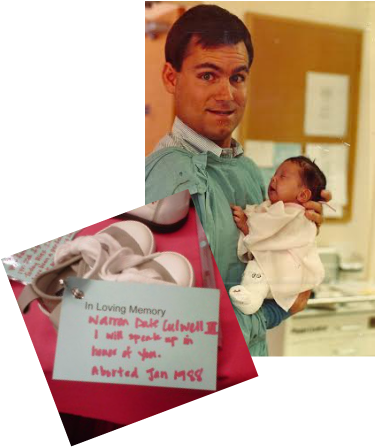 Her mother took her back to the abortion clinic where she learned that she had been pregnant with twins…One was aborted; One survived. My life is a testimony that there are wonderful alternatives to abortion (such as adoption in my case) and an accident/unwanted child still deserves life…even a child with disabilities. I was born 2 1/2 months early, weighed 3 lbs 2 oz, had dislocated hips and club feet. I had to wear casts on my feet, a harness and eventually a body cast. The abortion still affects me today. All that to say, LIFE IS STILL WORTH IT. If my life can touch just one person who has had an abortion or considering an abortion or adoption, then I am fulfilling my purpose in the pro-life movement. Traveling and sharing my story was not something that I had planned for myself, but God proved to have better plans for me than I had for myself. Sharing my story is as much of a gift to MYSELF as it is to others.